Need to move your wine cellar? Wine is a fickle lover. The ultimate aphrodisiac can sour in the sun and bleed flavor if left in the heat. It’s not much of a dancer, either, and it hates having to stand up, and winos need to care for their prize wines accordingly. Wine is especially fussy during a move. The slightest offense can ruin your chances of getting it to your new home in shape for a good taste. Wine should be moved with the care and consideration deserving of a significant other on an anniversary. This, of course, means box it up and pack it tight! Get supplies – You’ll need moving boxes, tape and packaging. Line the box – Cover the bottom and sides of the box in packaging before placing a bottle in. Horizontal! 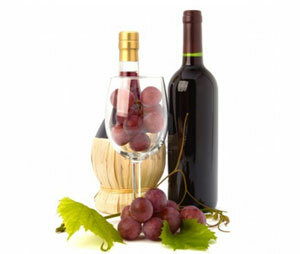 – Pack your wines horizontally so that they lie side by side. You should always lay wine on its side to keep the cork moist. Otherwise, air can seep in. Use two layers – Make sure ample packaging separates each bottle. Then, if you want, add another layer of packaging and another layer of bottles. However, do not include more than two layers of bottles, and, again, make sure there is ample packaging separating each bottle. Cushion, tape & label – Pack the box tightly so that the bottles won’t move much. Climate control – Some moving trucks come with climate-controlled trailers. These trucks allow you to control the temperature inside the trailer. 55 degrees is ideal for wine. 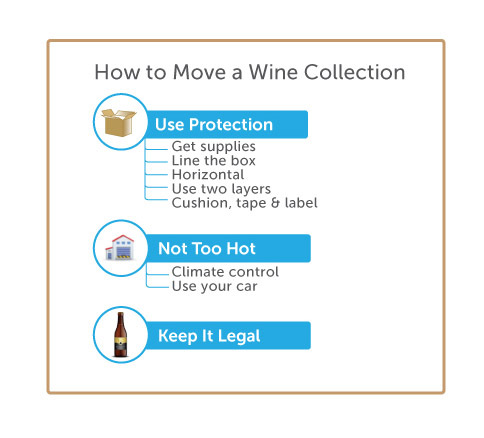 Use your car – If you have space in your car or in the cab of the moving truck, put the wine boxes in there. This will let you protect your wine from the elements just like you do yourself. Also, make sure to pack your wines last and to unpack them first. Some states have restrictions as to how much alcohol you can bring in or have at one time. Check with your new state just to make sure you aren’t running afoul of its wine laws. Not a wino? Learn how to move your liquor collection.